Why Don't Pet Rats Have Fur on Their Tails? It's hard for many people to accept pet rats. They are viewed as dirty, diseased, and gross by many although these are false accusations. The reality is that they make great companions and are highly intelligent pets. I may be somewhat biased owning a rat myself and having worked with dozens of sweet natured pet rats. It seems that the physical feature that bugs people the most is their hairless tails. I've met many people who just can't get over their long naked tails. So why don't pet rats have fur on their tails anyways? 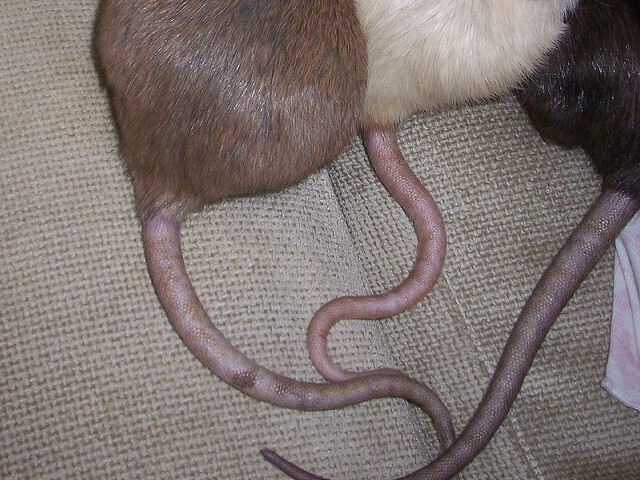 Rats need their hairless tails in order to survive. There are two very good reasons why pet rats do not have fur on their tails. Rats don't sweat like humans or pant like dogs. They can also overheat very easily. Their tails help them release excess body heat when they are hot. Pet rats use their tails to regulate their body temperature put quite simply. If they had fluffy tails, they would become overheated quickly. So this is the first reason why pet rats don't have fur on their tail. Rats actually do have hair on their tails. They have very short and stubby bristles on their tail. These tiny hairs help them to keep their balance. The hairs kind of stick to things helping the rat cross narrow paths or climb around. Rats will wrap their tails around things when they are climbing or trying to balance on something and the little sticky hairs are just an added bonus. If their tails were fluffy and furry they would be too slick to grip onto things. So there you have it! Those are the reasons why pet rats don't have fur on their tails. Hopefully this can help some people overcome the whole "tail not being visually appealing thing". Just think of a rat's tail as an important survival tool to them. And remember - it's what on the inside that counts! Rats are way more intelligent than hamsters (in my opinion). That's just my opinion though so I hope I don't offend anyone! I've owned both a rat and hamsters and they just seem so different from each other. I guess I can see the similarity between worms and rat tails lol. I've met a lot of people who didn't like the tail thing. We never knew that. How interesting. Have a fabulous Friday. We think they are cuties! Hey Bren I don't think I've heard of that movie before. I might have to look it up and see what you're talking about! Rats do make cool pets, though I've never had one. Really. I've raised mice. Lots and lots and lots of mice. But the whole hairless tail thing ... can't get past it. And they don't live terribly long? Never knew about their hairless tails, but honestly, I never really thought to question it. I had a pet rat when I was a teenager, but haven't had one since. They're incredibly sweet and cute. I don't find the hairless tail to be gross - in fact, I kind of like it. It's very soft and feels much like the hairless part of a dog's belly. The only thing I found gross was... ummm... the testicles. When Rat was young (he didn't have a formal name, I simply called him Rat), I would take him out of his cage and hold him and let him crawl around on me as he pleased. As he got older and his testicles got bigger, it grossed me out to feel them dragging across my skin as he would walk up my arm, etc. I stopped taking him out of his cage much after that, other than to clean it... which makes me very sad to think about now. If I had a pet rat now, I think I would have a female. However, I would also feel bad about having a lone rat now. 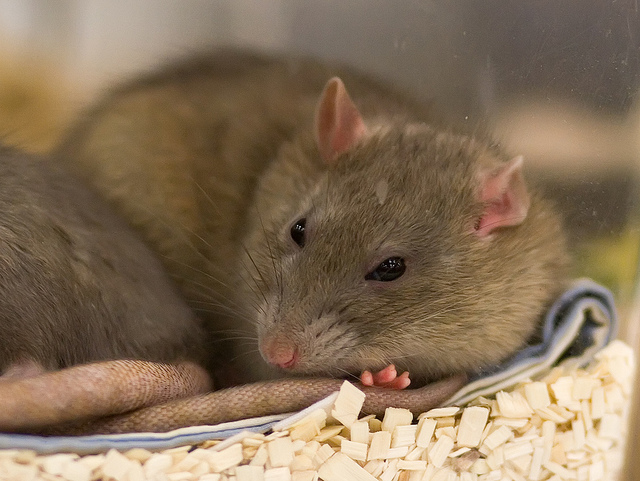 Do rats like companionship? Would two females get along? Hey Pam I've never had a male rat before, but I actually wanted a male. I guess I never put much thought into the testicle thing before either, but can see how it might be a little unpleasant to some. I have a female rat right now. Rat enthusiast actually recommend that if you get a rat, you have two because they do like companionship. If you only have one, a lot of interaction with them is recommended. More so than if you had several. I've also heard that female rats are not as "cuddly" as males. Interesting. I never knew about their tail. Inneresting. Funny how TW loves ferrets but thinks rats are icky and Pop says ferrets are just big rats. They are actually pretty different! Ferrets have teeth like cats and eat meat but rats have "rodent" teeth and are omnivores. Ferrets are also "stinky"... I've had one and the smell didn't bother me though. Rats don't typically smell like anything. Well we learned something new!!! We had no idea their hairless tails had such a purpose! We used to have a very sweet pet rat named Dumpy. He looked like a black & white holstein cow...such a cutie. Learn something new every day, although the tails don't bother me, but then neither does the feel of any snakes I've handled. Growing up I had snakes, box turtles, lizards (anoles), pretty much any critter I could lay hands on, much to my Mom's dismay! Oh, and horn toads lived in my grandfather's garden in east Texas...they were the best! In high school in my home economics class we actually used rats on a food study of sorts (how different food affected them), and different students were required to take the rats home on the weekends. Often I was the only volunteer, because I really loved them. I was particularly fond of a beautiful black and white rat we had named Randy. That was fascinating! I had no idea why their tails were like that. Their tails look a lot like worms, but they have very cute faces. Lol... well Misaki you are quite a bit different than a rat!